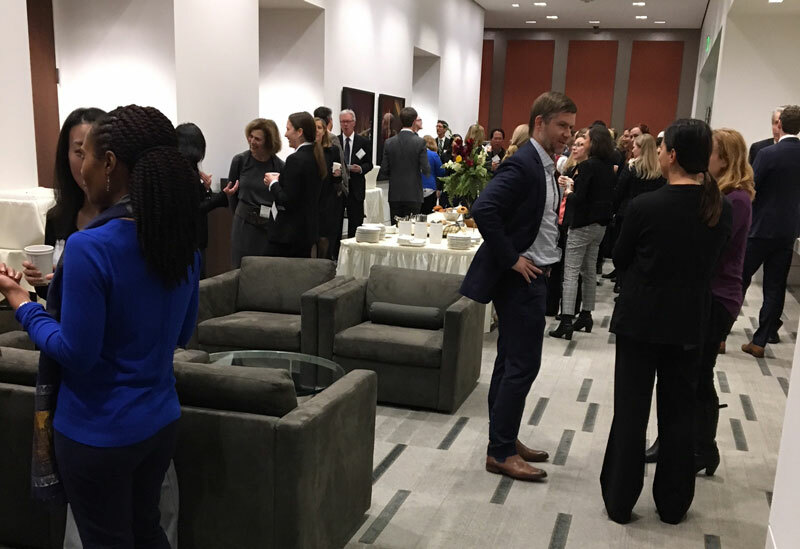 Financial Women of San Francisco (FWSF) co-hosted this annual industry leadership event on March 13 with the San Francisco Bank Attorneys Association and the Financial Institutions Committee of the California Lawyers Association. Despite challenging weather conditions, approximately 130 people attended this program, held once again at the Federal Reserve Bank of San Francisco. Attendees included a mix of lawyers and other financial services industry professionals. Networking before the event and during the break provided a chance to exchange perspectives on the topics covered and to make new connections. William Kroener, Senior Counsel, Sullivan & Cromwell LLP, began with a review of the political/regulatory landscape, changes on Capitol Hill, a review of the new heads of the regulatory agencies (and what it might mean), the impact of the midterm elections, the outlook for statutory reform, and initiatives for regulatory reform. 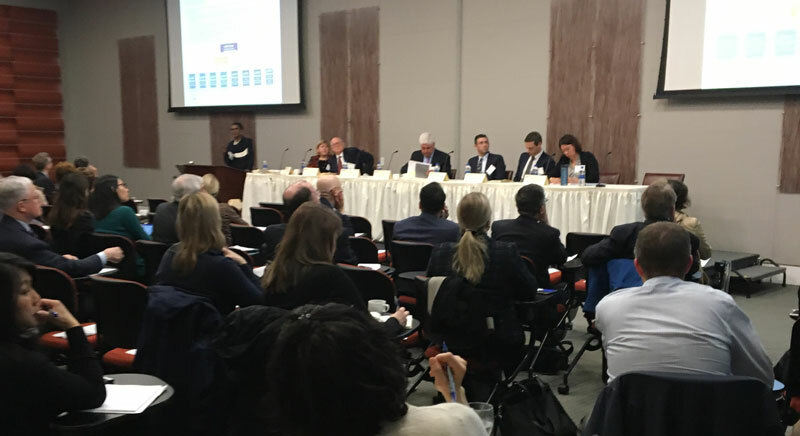 Deborah Bailey, Managing Director, KPMG, addressed the examination and supervision developments/landscape including the Federal Reserve’s changes in their supervisory approach and expectations of the board of directors. As part of her presentation, Deborah reviewed the Large Institution Supervision Coordinating Committee (LISCC) structure (which includes the head of supervision for the Federal Reserve Bank of San Francisco). She covered the proposed reorganization of the large financial institution (LFI) supervisory function including the horizontal oversight structure designed around the five supervisory pillars, as well as the components of the proposed LFI rating system. She also provided KPMG’s perspective on the 10 key regulatory priorities for 2018. Michael Flynn, Partner, Goodwin Procter LLP, was next with a presentation on CFPB developments and GSE reform. His presentation included a discussion of possible Congressional actions including TILA-RESPA Integrated Disclosure (TRID) amendment “fixes,” alternative possibilities for GSE reform and a “Madden Fix” bill. Aaron Rozenek, Compliance Consultant, Volcker Compliance Program Office, Wells Fargo, covered the Volcker Rule simplification and reform, context and outlook for reform. Maureen Young, presented for Clifford Holly, Chief Security Office, EVP, Bank of the West, who was unable to attend due to illness. After sharing an entertaining, but far too real, music video about hacking, Maureen covered cybersecurity developments and threat challenges, especially those specific to financial institutions. Conor French, General Counsel, U.S. Funding Circle, presented on fintech developments, challenges/opportunities for fintech companies in dealing with banks, compliance/regulatory challenges, diversity of fintechs, including lending and payment business models, and an outlook on the fintech charter. Jennifer O’Reilly, Director of Enterprise Risk Management, First Republic Bank, wrapped up the panel with a presentation on risk management developments, including the three related proposals from the Federal Reserve aimed at the largest banks. The Federal Reserve’s proposed large financial institution (LFI) rating system would no longer provide a composite rating; instead there would be separate ratings for Governance and Controls, Capital Planning and Positions, and Liquidity Risk Management and Positions. The Federal Reserve proposals include corporate governance principles to enhance the effectiveness of boards of directors and to distinguish between supervisory expectations of senior management, business line management and Independent Risk Management (IRM). The Office of the Comptroller of the Currency (OCC)’s concerns include loan growth and easing of commercial underwriting practices, elevated operational risk (particularly due to cyber threats and the increased used of third-party service providers), and elevated compliance risk in BSA/AML, Compliance Management Systems (CMS) that lag evolving compliance risks, change management, and the increasing complexity of consumer compliance regulations. The CFPB is studying everything and has brought in people from other agencies to assist. A major grey area of regulation is marijuana. Business e-mail compromise continues to be a key cyber-security concern. Other countries appear to be more responsive to fintech innovation. The industry is watching Square’s application for an industrial loan company (ILC) charter, SoFi’s plans now that it has a new CEO, and what happens regarding the OCC’s proposed fintech charter. Many thanks to Maureen Young for working with her colleagues representing the Financial Institutions Committee of the California Lawyers Association and the San Francisco Bank Attorneys Association for providing a program that contained such rich content. This program continues to be one of the highlights of the year for career development for those involved in financial services regulatory compliance. We also want to thank the Federal Reserve Bank San Francisco for hosting this event. FWSF has other exciting events coming up, including the Art of Allyship: How Leaders Create Inclusive Cultures by Calling Others In, Wells Fargo Learning Center , April 17, 5-7pm, Masters Class, May 16-, 5:00-7:30pm, KPMG.Check out our Events Calendar https://financialwomensf.org/events/.